This is a new award which seeks to recognise sixth form colleges which best epitomise the qualities which make the sector so distinctive; in particular, colleges who can provide evidence demonstrating excellence in 16-18 education across the board in terms of the quality of teaching and learning as well as outcomes. The award also recognizes colleges who reach out to other institutions and demonstrate a commitment to sharing good practice and raising achievement more widely. It is open to all designated sixth form colleges in England. To be considered for the award the College had to demonstrate that it met some key criteria including consistently strong outcomes for students, teaching and learning practices which are particularly effective and innovative and a commitment to disseminating good practice which has had a positive impact beyond the institution. In addition, these qualities had to be seen as common practice in the College. 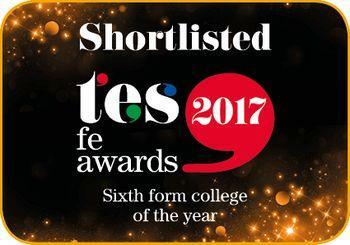 Elly Tobin, Principal at the College commented, “We are delighted to have been shortlisted for this prestigious award which will mean so much to our students, staff and the wider community we serve”. The TES FE Awards 2017 are sponsored by The Education and Training Foundation and celebrate and reward the dedication and expertise of the people and teams who continue to make a significant contribution to improving the skill levels of young people and adult learners. The winners will be revealed at a high profile gala awards ceremony at The Grosvenor House Hotel, Park Lane, London on Friday 24 February 2017.